For those who travel frequently and like to exercise, I have to tell you that my town, Montevideo, is a runner’s paradise. Where else can you run most of the year in 60-70 degree weather, little humidity, and more importantly, in a beach right along the water? 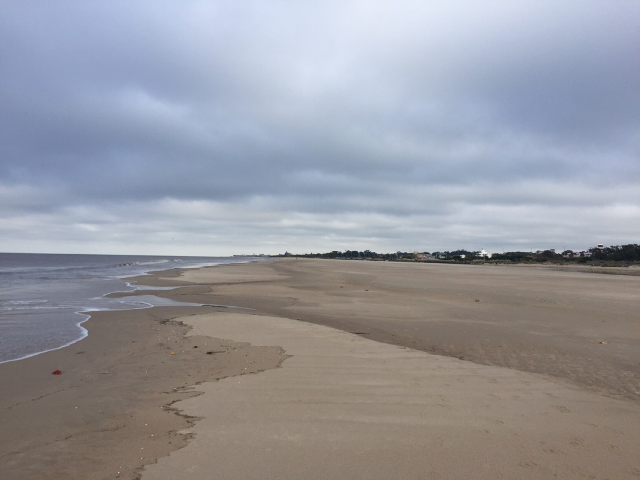 The beach is also perfect for running – almost isolated with hard sand, no pollution, and with a nice breeze to cool you off. If you run early in the morning you can see the sunrise and its reflection on the sand and the calm waters. You can also run inches from the slow breaking waves. Montevideo is the only capital in the Americas where you can do this. New York has Central Park, Mexico City Bosques de Chapultepec, Buenos Aires Bosques de Palermo, and Sao Paulo Ibirapuera. Montevideo does not have those urban sprawling parks, but it has miles and miles of open beaches. The photo below is of the beach in the Carrasco neighborhood, which is only 10 mins away from Pocitos where our RedMas office is located. The beach in Pocitos, one block from our office is also gorgeous (just a little bit more crowded, with softer sand, and shorter).